Oleamide is a naturally occurring lipid that aids in sleep and relaxation. As a dietary supplement, Oleamide is great for creating a chilled-out, relaxed feeling, and can be used prior to sleep or to unwind from stress. We’ve got a lot of information about Oleamide, how it works, what it does, and how to take it. However, sometimes it’s better to hear what other people’s experiences were. So, we’ve compiled a list of five Oleamide reviews. There are lots more reviews, available from our website. You can also find user experiences on drug-forum.com and on erowid.org. Enjoy! “I had great results from other Liftmode products so I decided to try this supplement as I have not seen it offered by anyone else or even heard of it. I researched Oleamide on various websites and read some medical journals on the web and it seems it worked for anxiety and sleep-related problems. “Oleamide is interesting, in high doses it's relaxing and gave a [relaxed] feeling similar to.. and, it also made me a little dizzy but not in a bad way. In lower doses it gives you mild relaxation, helping somewhat with stress and tension. Since it's from olive oil I would assume it would also possess properties beneficial to overall heath but I'm not sure as I could not find much information about Oleamide on its own. “As for the Oleamide, I must say I am absolutely pleased with the professional presentation of the order. Included was the product (well sealed), a 0.15 cc scoop (great for measuring these kinds of products and an item I was not expecting with my order), and a Certificate of Analysis that really helps dispel any concerns about the purity of the product. I have taken a dose of the Oleamide, around 200mg, and it does indeed produce a pleasant, subtle relaxation. Not overpowering in the least (for me but everyone will be different) and a nice way to take the edge off the stress and pressure of the day. These reviews help shed some light on what other people's experiences with Oleamide have been like. For more information on what Oleamide does, why not take a read through our product description? 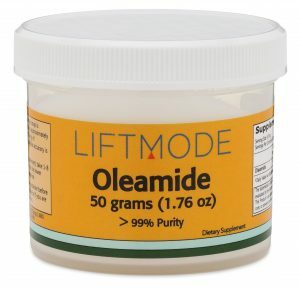 Liftmode customers are always satisfied with their Oleamide orders.